As we described in our previous article “hiring freelancers vs offshore development teams“, for telecommuting you can choose either to hire freelancers / remote contractors or to set up an offshore development team. The first option is rather flexible and presupposes significant money savings, but poses some risks. Here we will describe the pros and cons of establishing a unified remote development team. The infographics below will show the comparison of both options. This model is suitable, when you are looking to outsource long-term development projects. 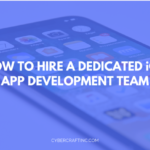 When you have a steady workload for several full-time developers, but want to hire them remotely to save costs, you should definitely check out this option. 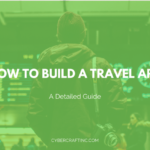 You just pick an offshore location and a reliable local service provider, and they will help you to assemble own remote dedicated development team. Unlike collaboration with individual contractors, the remote team model provides legal guarantees. You get a legit contract from your provider of offshore outsourcing services reflecting all the details of your cooperation: team procedures and consequences for failing those procedures, fixed deadlines and payment rates, project standards and expected levels of communication. Such a contract can help build trust and transparency, which is of crucial importance when delegating a project to remote teams. Every member of a remote team signs an NDA to eliminate the risk of information leakage. So all intellectual property rights, source code etc. are transferred to you. Reputable offshore software outsourcing companies hire only the best talents by arranging several rounds of interviews and performing background checks. 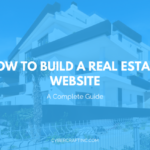 There is no need for you to browse hundreds of websites looking for individual experts, as you can find a professional vendor who will do the job for you. Just contact a company and explain what kind of specialists you need for your project. Then a manager will give you a list of potential candidates, whom you can interview and hire. Another important benefit of hiring an offshore development team is high quality standards that vendors impose. This is simply because most companies are really anxious about their reputation, as this is what their business stands on. Therefore, they look for top talent and make sure that every team member has the needed knowledge and expertise. In such a way, they can guarantee that your expectations will be met. Unlike individual contractors who are hard to control, you can monitor every step of your offshore development team.You sign a contract including all the details of your cooperation, i.e. the trial period, working hours, communication aspects, etc. The vendor ensures effective communication within a remote team and a smooth information flow between your in-house and offshore developers. The company has tools for evaluating a team’s effectiveness as a whole as well as a team member in particular. It is in a vendor’s best interest to ensure the highest productivity, so it constantly monitors the performance. Hence, you have more control over a team rather than an individual contractor. When hiring a team of offshore software developers, you can forget about all the issues regarding social guarantees, peculiarities of work regulations, etc. Knowledgeable vendors with the needed expertise can handle all aspects of your collaboration. So, you will have less worries and more free time. If you can hire a freelancer in a click of a mouse, hiring an offshore development team will take a bit longer. First, you should find a reputable outsourcing service provider specializing in setting up dedicated teams. Then explain all your requirements and wait until the needed workforce is provided. It may take up to a month to find all the specialists, select the best candidates and onboard them. Hence, by waiting a bit longer you get a professional team. When you hire a dedicated development team, you can go for a “Fixed price per head” or a “Cost plus” pricing model. Regardless of your choice, you can determine the number of employees and their specialization. However, you should avoid choosing a deficient pricing model as you will pay extra in the end. Fixed price per head means you pay a fixed rate that includes all the expenses: an employee’s salary, a provider’s fee, team maintenance costs etc. However, this model is not transparent, as you never know how much the provider pays to your developers. So, the salary rates are often lower because the company wants to increase its revenues. As a result, such companies hire junior specialists and have higher employee turnover, which influences production time and quality. The cost plus model is the most effective solution for setting up an offshore development team. It gives you control over hiring process and access to all the expenses, including salaries. As a result, you have a better integrated and a more loyal team. For companies trying to increase productivity and stay competitive, both models provide significant benefits, but may also have certain disadvantages. 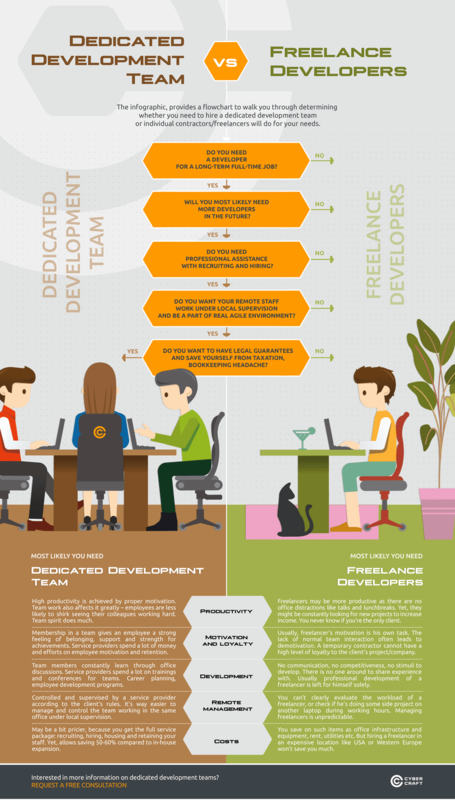 When comparing those, you can see that hiring dedicated developer teams may be a bit pricier, but less risky than hiring freelancers.